What is Cone Beam CT 3D Imaging? Physicians have relied on computerized axial tomography scans (CAT) for many years. CAT scans are an X-ray procedure that uses many different X-ray images with the help of computers to generate cross-sectional or even three dimensional (3D) views of internal organs and structures within the body. A knee replacement surgery, for example, would never be performed without first examining 3D imaging. More recently however, new technology has been developed that provides 3D imaging at a greatly reduced radiation exposure and cost compared to medical CAT scans. This technology is called Cone Beam CT and dentists have begun to rely on these 3D imaging techniques to provide them with a detailed view of the mouth and skull. 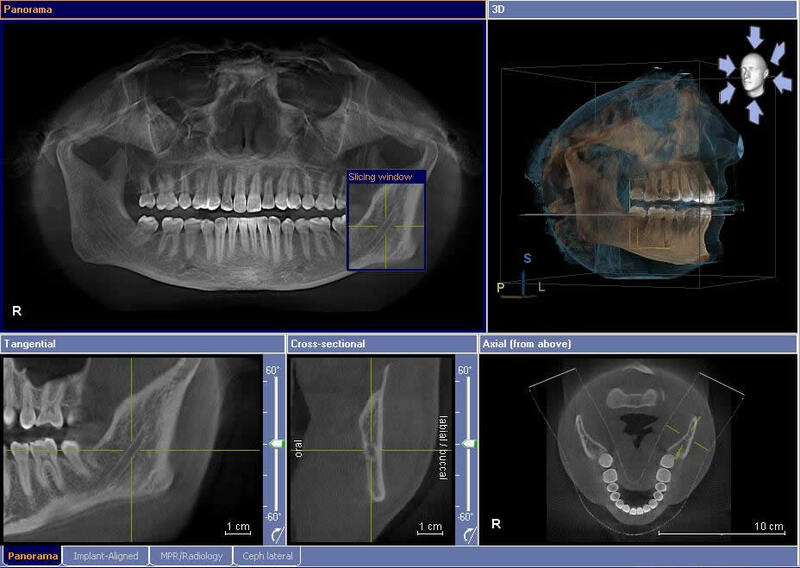 The advantage that 3D imaging holds over regular dental x-rays is that bone structure, bone density, tissues, and nerves can be viewed clearly. Cone Beam CT scans can be completed in less than half a minute. This means that far less radiation enters the body than if a regular set of bitewing X-rays were taken. The main use for CT scans is as an aid to plan dental implant treatment and other oral surgery. Dental implants are the most sophisticated replacement for missing teeth, but have historically proven to be time-consuming to place. CT scans vastly reduce the time it takes to place implants due to the ability of the dentist to see the anatomy of the implant site before any surgery is done and to plan accordingly. How does the CT scan help our Staff? How are Cone Beam CT scans used? CT scans are advantageous because they allow the dentist to magnify specific areas of the face. In addition, the dentist can easily view cross-sectional “slices” of the jaw, which makes planning treatment easier and faster. How are Cone Beam CT scans performed? CT scans are quick and simple to perform. A Cone Beam Imaging System is at the heart of the scanner. During the scan, the patient stands or sits stationary on a designated seat. The cone beams are used to take literally hundreds of pictures of the face. These pictures are used to compile an exact 3D image of the inner mechanisms of the face and jaw. The dentist is able to zoom in on specific areas and view them from alternate angles. Additionally, the scanner provides an open environment, meaning that claustrophobic feelings associated with medical CT scanners are eliminated. The cone beam CT scan is an incredible tool that is minimizing the cost of dental treatment, reducing treatment time and enhancing the end results of dental surgery. No, the Galileos CBCT scan process is completely painless. Why a CBCT scanner rather than a regular Medical CT scanner? X-Ray Radiation exposure to the patient is up 10 times less than a regular CT scanner. Much faster scan time. Scan on a CBCT takes between 10-40 sec, while on a regular CT scanner it takes a few minutes. Cheaper, average price of a CBCT scan could be up to 50% less than a regular MDCT scan. What are the benefits versus risk? Unlike regular x-rays CT scans can discriminate between many types of tissue including bone, teeth, nerves and soft tissue. CT scans are noninvasive, and can eliminate the need for exploratory surgery in some cases. CT can identify the effects of conditions such as infection and tumors. A cost effective tool for imaging a wide range of clinical problems. 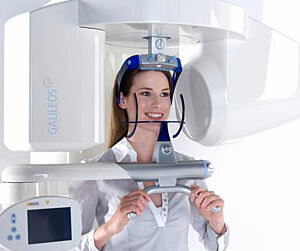 In a dosimetry study conducted by Dr. Ludlow (2007) of the University of South Carolina the Sirona Galileos has the lowest radiation dose of any cone beam machine on the market. One scan is compared to about 8 days of normal background radiation. This doesn’t even mean 8 days exposed in the sun but only 8 days of normal radiation by simply living on the planet earth. As a comparison, a full mouth series of x-rays taken in a dental office using old technology x-ray films (not digital x-rays) is equivalent to 47 days of background radiation. As with all imaging modalities that use ionizing radiation, the use of CBCT does involve a consideration of risk to the patient. However, it has the benefit of providing useful information needed to assist in making a diagnosis and/or in facilitating treatment. When your doctor refers you for an x-ray examination, he has made the determination that the benefit outweighs the risk. Of course, it is ultimately up to you to decide whether to undergo the examination. Bear in mind that the risk of most x-ray examinations are much less than other risks we commonly accept in daily life.